Raven Lining Systems, a leading provider of spray lining products to protect and rehabilitate manholes and underground infrastructure, celebrated its 30th anniversary throughout 2018. The company was founded and completed its first epoxy manhole application in 1988. That epoxy product became known as Raven 405 and is still the company’s flagship product. Raven 405 is a solvent-free, 100 percent solids, ultra-high-build epoxy coating formulated with exceptionally high physical strengths and resistance to a broad range of chemicals. As Raven 405 became firmly established as a primary method of manhole protection, the company moved forward with other innovations. Raven established an impressive history as a leader in the water, wastewater and manhole rehabilitation industry, and recently expanded into the oil and gas markets, delivering environmentally friendly protection of secondary containment infrastructure. 1992: Introduced the Raven Certified Application Program, providing factory-trained personnel to use the specialized equipment to apply Raven products. Candidates are selected based on experience, expertise and capability to deliver quality results and superior customer service. Qualified candidates must acquire the equipment needed to properly install Raven brand epoxy systems and attend Raven’s training program, which is instructed by NACE-certified and field-experienced staff. 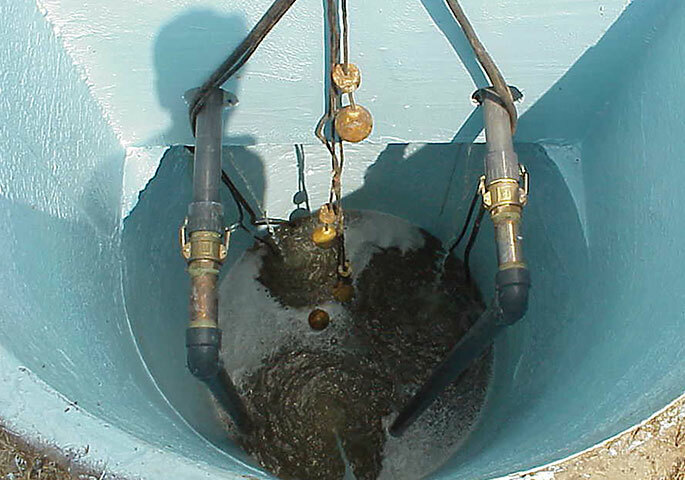 1996: Added to the product line AquataPoxy NSF Certified Products to provide corrosion control in potable water applications, including water tank linings, reservoirs, transmission lines, aqueducts and treatment facilities. They also can be used to structurally rebuild severely deteriorated infrastructure. 2009: Introduced cementitious products. Raven 705CA is a calcium aluminate product, and Raven 755 is a Portland cement product. They provide efficient application, quick-setting and long-lasting repair properties. The Raven 700 series can be stand-alone products or may be coated with Raven primers and topcoats. 2013: Introduced polyurethane/polyurea products, which are formulated to fill specific niches in target markets. Polyurethane is one of the most widely used polymers in the world and lends itself to many different types of applications. “It’s been a great 30 years and we are proud to have taken the lead in setting the industry standards,” said Rob Pawlak, VersaFlex and Raven Lining Systems chief operating officer. “Water and wastewater are the lifeblood of our company, but we have evolved into more than a wastewater company that sells Raven 405. In January 2018, Raven Lining Systems and VersaFlex Inc. merged, joining two respected brands in the specialty coating industry. VersaFlex is an industry-leading producer of 100-percent solids, pure polyurea-based technology used for the protection and repair of highways, bridges, tunnels and rail infrastructure. SLTM series joint filler is used for commercial and industrial flooring applications. FlexTain pre-sprayed liners are designed for secondary containment, and other maintenance and containment environments. “We are excited to become part of the VersaFlex team and leverage each other’s strengths to continue to provide the outstanding service our customers have become accustomed to over the past 30 years,” said Pawlak. “This is a strategic merger of brands, leadership, products and service, which will result in a stronger combined company to meet the specialty protective lining and rehabilitation challenges that are ahead,” said Joe Haydu, VersaFlex president at the time of the merger. Plans are to complete the integration of Raven’s Broken Arrow, Okla., facility into VersaFlex’s Kansas City, Kan., facility by the end of the year. The organization also plans to combine VersaFlex’s Polyurea University with Raven’s Certified Applicator Program to develop an industry-leading-training and technical support program. Both VersaFlex and Raven are ISO 9001:2008 certified for operations. VersaFlex brings the additional quality strength of being ISO 9001:2008 certified for design.